Forget potato salad this summer. Who needs those extra calories by adding loads of mayonnaise to an already carb-filled side? Smashed potatoes are soft with a crispy exterior, and are drizzled with olive oil, spices and Parmesan cheese for a burst of flavor. You'll thank me. Enjoy! Put the potatoes in a large saucepan and fill with water. Make sure the water rises at least 1-inch over the potatoes. Bring to a boil. Reduce to low and simmer until the potatoes are fork tender, about 30 minutes. Alternatively, you can make a small slit in the top of each potato and microwave for about 7 minutes per pound, or until the potatoes are tender. This might take less time depending on the size of your potatoes. Set your broiler to medium. When they potatoes are done, place on paper towels to dry them off. Once dry, transfer the potatoes to a baking sheet. Use a paper towel or paper plate to carefully mash them to 1/4-inch thick. Mix the oil, garlic powder, paprika, onion powder, pepper, salt and Parmesan cheese together. Drizzle a small amount of oil mixture over top of each smashed potato. 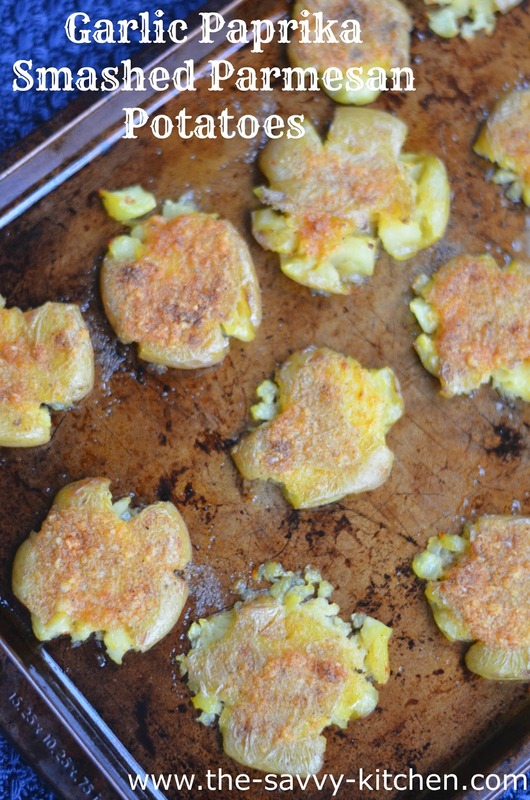 Set the potatoes under the broiler for 5-8 minutes or until they become crispy. Keep an eye on them so they don't burn. Remove from oven and sprinkle with fresh parsley. Enjoy immediately.